I began my career training at Brinsbury College, Pulborough in 2002 where I undertook a 3 year course and successfully gained my City & Guilds qualifications in animal care and dog grooming. From here, I then moved on to working within a Grooming Parlour in the Guildford area to gain more of an understanding and an insight of running my own business. 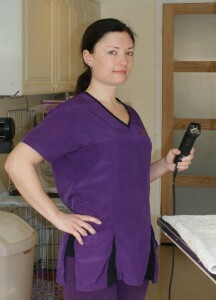 From gaining the above experience and skills, “Becky’s Professional Dog Grooming” was then created. From 2007 onwards, my business has been growing healthily. I work from my Grooming Parlour at my home in Beare Green, Dorking, 5 Days a week, Monday through to Friday. I really enjoy getting to know all my customers, both pets and owners. I take great care in understanding each dog’s individual needs and requirements from the condition of the coat through to welfare of the animal. I offer a professional style to the breed standard; however, I am also happy to liaise with each owner’s personal requirements. A happy dog is a healthy dog. Having your dog groomed professionally isn’t just for the look and style, but also for the animal’s health and well-being. For example I have seen many dog with fleas, ticks, signs of mites, skin conditions, lumps, bumps, grass seeds, thorns, or even ear infections which the owners may have not have been aware of. Keeping on top of these possible problems will help prevent any health issues for your pet in the future. I will be happy to advise on any possible course of action.